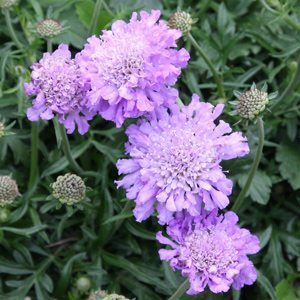 Grown for the attractive flowers that appear in masses from summer through to autumn, Scabiosa are an easy care garden plant for tough conditions. Also known as the ‘Pin cushion Flower’ give them a little space in the garden and they will reward you with a long flowering, easy care plant. These are a perennial plant that grow well in a range of climates and over time will form a clump to around 30cm by 30cm. Scabiosa are frost tolerant, come in a broad range of colours from white to red and near black, and can make a good cut flower. Species vary a little with some being mound forming with a neat habit, others are more clump forming. A well drained humus rich soil and good sun, especially morning sun are essential for good growth and flowering. Sandy soils will require some additional organic matter added, clay soils will need to well drained and not heavy and wet during winter. During long dry periods, extra water will be required. You will either buy seedling plants which are best planted into the garden in spring, or you may decide to grow Scabiosa from seed. Seeds are best planted into trays in late winter and grown on in a cold frame or indoors until the weather warms a little. Deadhead as the flowers fade to promote a second flush of flowers. At the end of the season in early winter, prune the perennial types right back to ground level. S. atropurpurea – Also known as the ‘Sweet Scabiosa’ deep crimson flowers with some variation in colour. S. aucasia – Pale blue to mauve largish flowers, this species has been in cultivation for over 100 years. Reaches around 7- cm in height. S. columbaria (see picture right) – Widely hybridised form, flowers are pink, this species has a lower growing nature than some others. S. drakensburgensis – Very attractive white flowering species, the deep green foliage acts as a good contrast. Taller growing than many reaching around 70cm in height in good conditions. S. speciosa – Not widely offered, however available from some growers, this is an Alpine species from Pakistan. And of course we have the cultivars including ‘Crimson Clouds’, all make great cottage garden plants.